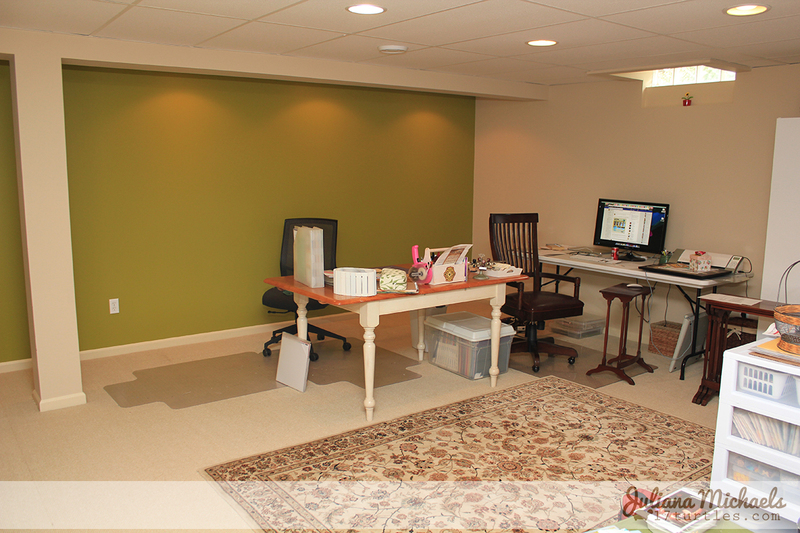 The scrapbook room progress has been slow, and it is actually almost finished. I still need to hang a few things on the wall and I'm looking to get a new computer desk. I need something that is a little more ergonomically correct than what I have been using. That's the Physical Therapist in me that is talking out loud and telling me I need a better set up so my neck and shoulders don't bother me so much! Today, I thought I share you some of the progress photos. Above and below are photos of how things looked and how I tried to function once the wall was painted but I still didn't have my book shelves done. I seriously had stuff everywhere. At least on the one side of my room. The area right around me desk wasn't too bad. I initially tried to use a Valspar paint on my bookshelves, but it went on horribly when I attempted the second coat. I'm not sure what the problem was and I was unable to get any assistance on what to do about it from my local Lowe's. Because of this, I re-sanded all of them, applied another coat of Kilz and then switched to the Sherwin Williams. It went on beautifully and dried perfectly! 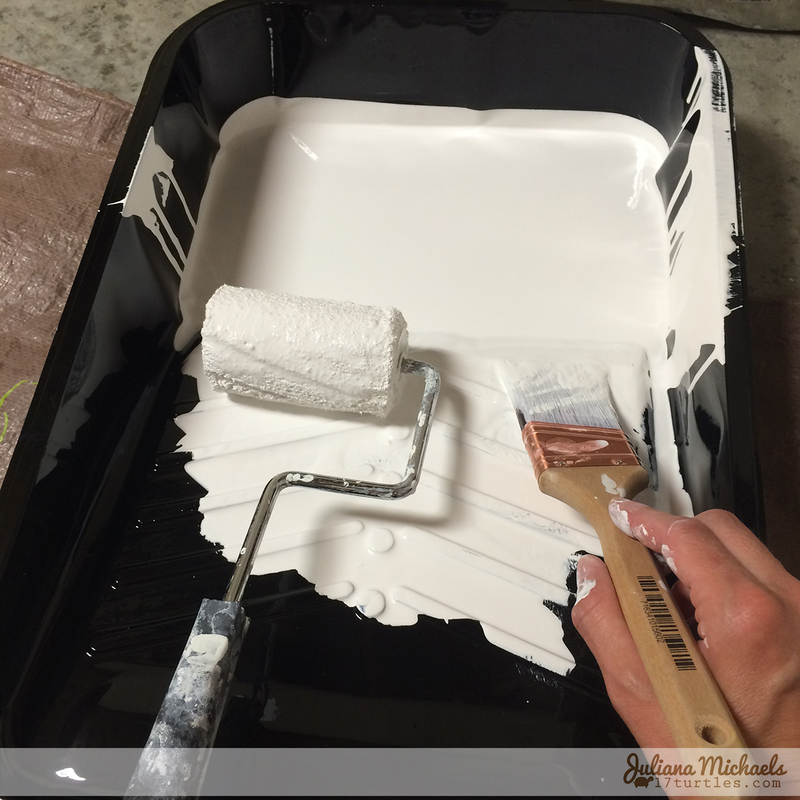 I highly recommend it if you are doing any furniture makeovers. Two of my book shelves were stained wood and the other was pressboard and laminate. Now, they all look the same and it makes me so very happy! I was also a very happy lady when I finally finished painting my shelves. It was now time for one of my favorite things...ORGANIZING! 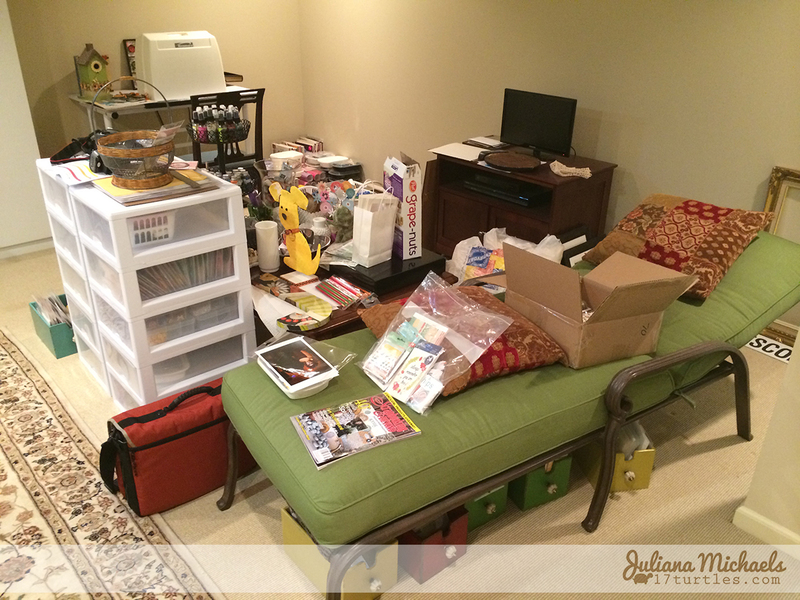 I moved a few of my craft and scrapbooking tools and supplies to a new locations, but a lot of things went right back where they had been before. The things that stayed in the same place just worked for me there, so I didn't see the need to get totally crazy moving things around. I will of course be sharing more details in another post once I finish up the last bits I mentioned. 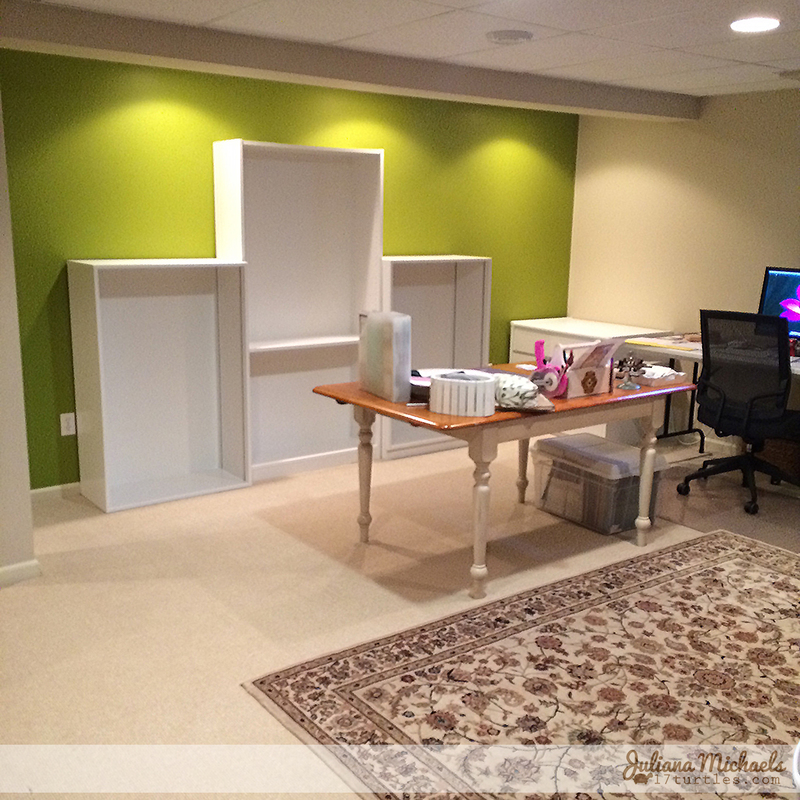 Overall, I really love the wall color and the white shelves really lighten up the room. 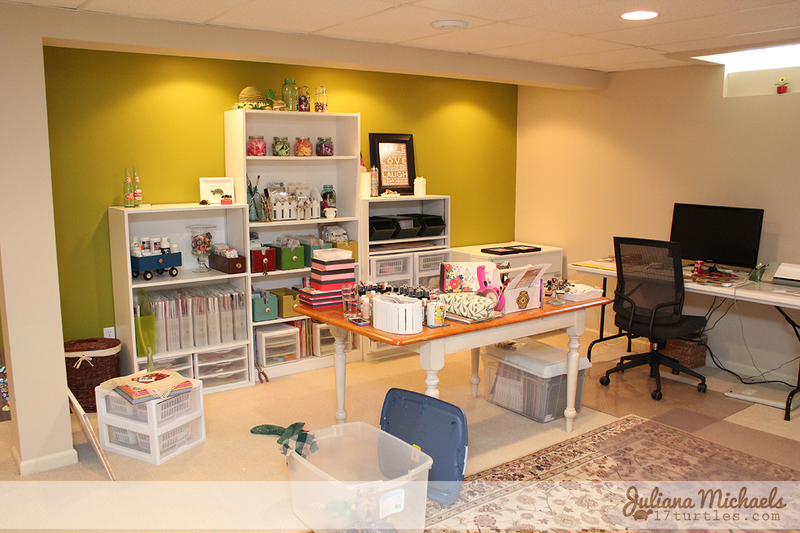 If you have any specific questions about anything regarding my Scrapbook Room Makeover or about how I store and organize things, feel free to leave me a comment below and I will give you an answer. Thanks Mendi! I love that is finally coming together too! I will be sharing the finished project as soon as I can! 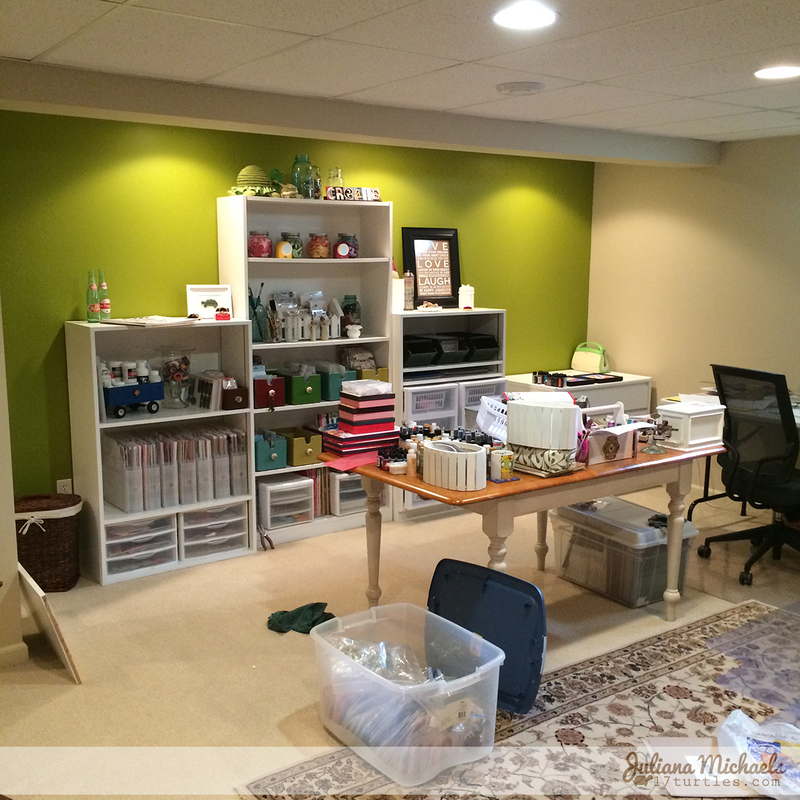 I'm not sure I could handle four walls of this color, but it is a fun and happy color for a craft room! It looks a beautiful Juliana! I love the green and your lighting! It's so inspiring! 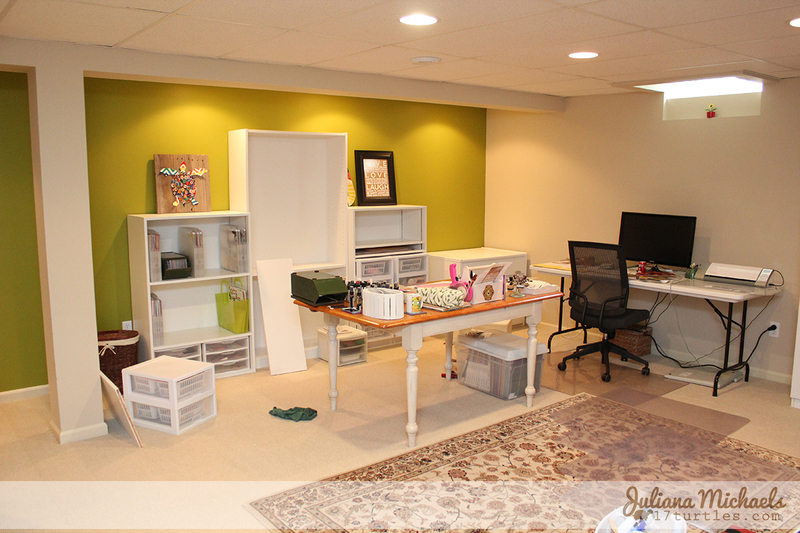 I'll be making over my craft room this summer too--I'm excited but I know it will be a bit daunting as well--like you said slow progress--but how wonderful when it all comes together and you see the result like your room, super gorgeous! TFS! It looks amazing!!! I recently got some Valspar too for a coffee table I am doing ... and it's all clumpy ... ugh ... so I might be doing another decoupage table! LOL!! Your room is really coming together beautifully! Love it! It's looking awesome, Julianna!! Can't wait to see the completed project! !